In order to tackle the challenging topics, you first need to know the basics. 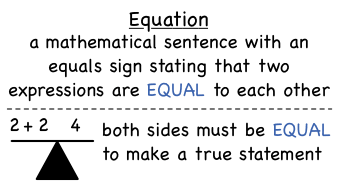 Equations are the start of some very fun and challenging math problems. Watch this tutorial to learn about equations! How Do You Write and Solve an Equation From a Word Problem? Word problems are just math in disguise! Follow along with this tutorial to get some practice translating a word problem into a mathematical equation. Then, see how to solve that equation and answer the word problem!